1. Keep accurate detailed records. This is a fundamental requirement as it is so easy to remember the winners and forget the losers. Can be quite cathartic after a bad day. Try and update your records on a daily basis whenever possible. 2. Separate betting money from personal finances. Again this may seem obvious but it's absolutely essential. Imagine betting from a joint-account that's shared with the wife and trying to explain a bad day's punting! 3. Bet at the best possible price available to you. Consult an odds comparison site such as "Oddschecker" before placing a bet. 4. Never chase losses. Never the answer. Remember there is no such thing as the last race, punting is a never ending activity of highs and lows on which a single day's activity should have very little impact. Similarly do not increase stakes simply because you are on winning streak. 5. Avoid "interest" bets. Very tempting when there is a high profile horse race or football match on television. Why have a bet on the Derby if you don't have an edge? 6. Learn detachment. Each bet is part of a long term plan and losing bets should not provoke emotional negative reactions however "unlucky" they appear to be. 7. Review your strategy. Which sports are profitable for you? If you categorise your records into sports and their sub-divisions (e.g. football: correct scores) this will make reviews easier. I review sport sub-divisions at least every three months, dropping or at least cutting back on areas no longer profitable. 8. Don't hedge unless......... the hedge bet is a value bet in itself. The most difficult rule to adhere to, particularly if you are sitting on a probable big priced winner. I find it very hard not to hedge and will sometimes compromise on this to get my stake back even if the hedge element is not strictly speaking "value". 9. Never follow tips. 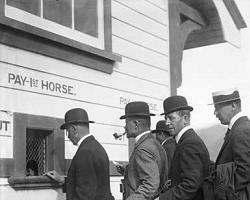 Particularly if the tipster is in some way connected to the tip, for example the owner, trainer or jockey of a horse. 10. Don't take short prices. Since the advent of GPT the professionals will tell you that 2/7 about a 1/5 shot is OK. But it's not for me, I seldom bet at odds-on. Further in horse racing I never take less than 2/1 (increased to 3/1 in 2018) about a horse winning a race. And finally never drink alcohol when you are betting as you will discover that some or all of the above rules will be impossible to keep! Just for your amusement here is a parody of good betting practice published in a 2009 edition of the "Racing and Football Outlook" We thank that publication for allowing the reprint below. 1. REMEMBER that it's better to lose than break even. After all, this is supposed to be gambling. 2. DON'T keep a record of your bets and under no circumstances review your performance. Remember the only way you will remain sufficiently confident to continue betting is to shield yourself from the truth. 3. DON'T think of your betting as a long-term business. Take what you can get while the going is good. Be fully aware you'll never make it pay in the long run. Others might, but you won't. 4. ALWAYS try to smash your way out of trouble. Whether you are in a hole or on a roll, play to the death. There's no way you'll get rich sitting tight on a substantial loss or, even worse, settling for a modest profit. 5. ALWAYS carry out as little research as possible. A thorough understanding of the form book only leads you to the same conclusion as the SP forecast that's in the paper and what's the point of that? 6. DON'T waste time shopping around. A winner's a winner, whatever the price. 7. TRY to take careful note of rumours and insider tips. Face it, these people know more than you. 8. ALWAYS mix betting and alcohol. Betting is like a driving test or a job interview you will approach it with more equanimity, calmness of mind and focus after a few pints of strong continental lager. 9. DO have as many fun bets as possible. Games of chance such as lotteries and roulette let you pick the numbers you like without your judgement being clouded by statistics, form and so on. 10. ALWAYS back at odds-on. Too many horses get beaten at odds-against.